Oil prices have bounced more than 150 percent off of December 2008 lows but inventory levels remain at historically high levels despite a healing global economy. 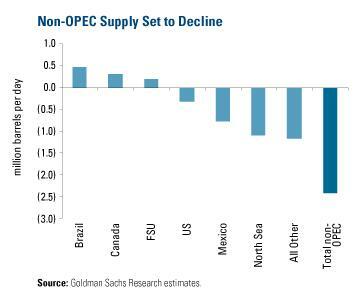 However, Goldman Sachs says robust 2010 oil demand growth will deplete these inventories over the next 12-to-18 months and diminishing production rates in key areas around the world will create a supply/demand imbalance. The above chart shows the decline in production from the world's top 230 projects. After peaking in 2009, production from these projects is set to fall for the next several years. Excluding OPEC countries (right chart), the decline rates quadruple from 2007 to 2012 (est). Over that time period, non-OPEC production is expected to fall by 2.5 million barrels per day. Only Brazil, Canada and the former countries of the Soviet Union are expected to see production growth. One of the largest contributing factors for this is chronic decline rates from some of the world's top mature fields. Mexico's Cantarell field, one of the largest oil fields in the world, produced 30 percent less oil in 2008 than it did in 2007-a trend that's expected to continue. Norway, the world's 11th largest oil producer in 2008, saw its oil production peak in 2001 and is down 27 percent since. Another big producer, Venezuela's state-owned oil company PdVSA has seen annual decline rates of more than 25 percent in certain fields according to the Energy Information Administration (EIA). Adding to the dilemma, many countries without decline-rate issues have been holding out production increases until projects become more cost effective; this is why we recently saw Russia overtake Saudi Arabia as the world's largest oil producer. The Saudis have been content to sit on the sidelines while awaiting the return of higher prices. The same goes for other OPEC countries; PIRA, an oil-industry consultant, says the cost of oil will have to rise above $80 per barrel in order for the cartel to increase production. With oil prices currently hovering around that $80 level, OPEC officials have recently hinted that production increases aren't off the table for the cartel's upcoming December meeting. Even if we see a production increase out of OPEC, decline rates from maturing fields and high barriers of entry to bring new fields online should keep the supply/demand balance tight for years to come. Brian Hicks and Evan Smith will be co-hosting a free webcast event with U.S. Global Investors CEO Frank Holmes titled "What's Driving Energy?" on Tuesday, November 3 at 12:00 PM ET. The presenters will be detailing the critical factors supporting long-term energy demand. Info here: www.usfunds.com/adclick.cfm?adid=2183.